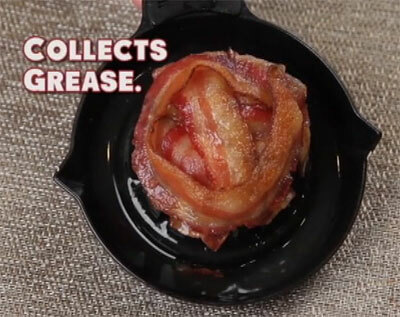 Bacon Bowl is great for anyone whose obsession with bacon is strong enough to overcome the need to wipe grease off one’s fingers after every bite. 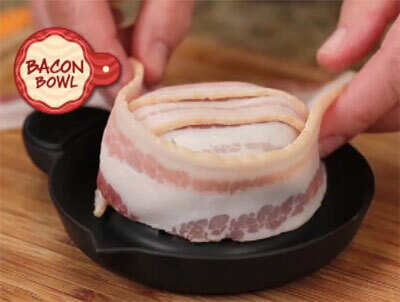 In the near future the Bacon Bowl brand will be extended to include Bacon Plates, Bacon Forks, Bacon Knifes, and Bacon Spoons, giving you the opportunity to eat all of your utensils, which will save time washing dishes. It will be very convenient during the six months you have left before keeling over from a massive coronary. 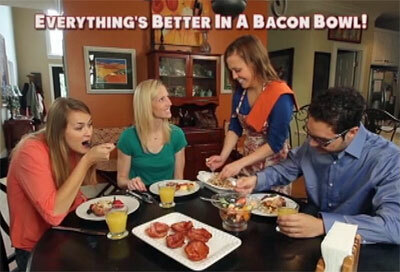 The Bacon Bowl infomercial hopes to not only appeal to the obese gluttons of Middle America, but also to tap into the bacon fad amongst urban hipsters. 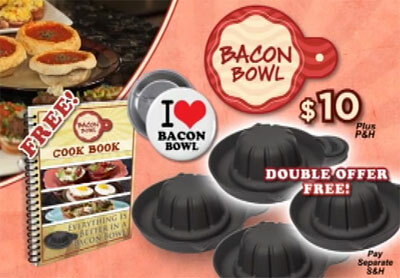 Clearly the “limited edition” I Heart Bacon Bowl pin is meant to be worn “ironically” by hipster douchebags. And if they wrap the strips tight enough, they might even be able to drink PBR out of a Bacon Bowl! Those “bowls” are so small that the increased calories from the bacon will probably be offset by the smaller serving portions. So I guess this really is healthy! A limited edition pin? That thing looks like a generic button anyone can make for themselves at Cafe Press. I’m gonna get this and make a bacon bowl and then fill it with bacon. 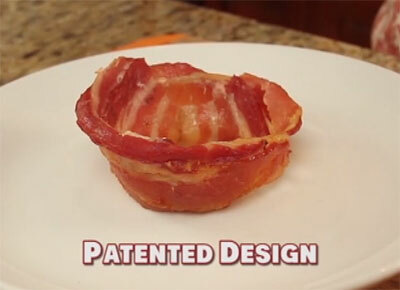 “Everything’s better in a bacon bowl!” Really? Even dessert, fruit or other things you don’t want covered in salt and oil?